The A. Lange & Sohne watches were born in 1845 in Saxon city Glashütte. The A. Lange & Sohne watch brand meaning “Lange and sons” is rightfully considered to be a trend setter in the world of wrist watches. 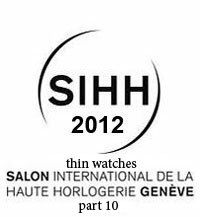 Today we can hardly imagine how a watch shop with 15 people in its staff grew to enormous watch industry, and the world knew about German wrist watches with famous name A. Lange & Sohne. Mister Lange manufactured not only watches and movement details with his colleagues, but also high-quality machines for manufacture of these watch details. German watches were given name, well-known for us, in 1868, when the elder son of Lange came into the company. 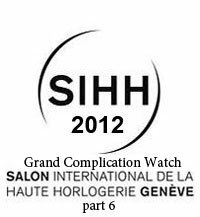 Swiss watch company A. Lange & Sohne considers that only those, who proved their interest in elite watch brand, can be distributors of the A. Lange & Sohne watches with complicated and exclusive movement. Today the original German watches A. Lange & Sohne take leading positions in the top-list of German watches de luxe. 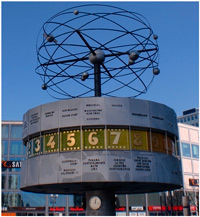 The top-list is published in well-known magazine about business news Wirtschaftswoche dated from 19th August, 2009. From the beginning of 90s in Saxon city Glashütte the A. Lange & Sohne masters produce elite wrist watches competitive with the best Swiss watch brands. These watches combine the spirit of the past and unique technical features. The brand founder arranged serial production of precise watches due to the division of labor. One master made one kind of details: someone created the hands, another one – spring-barrels, etc. Besides, The Saxon company left the foreign suppliers behind and put feet down firmly on the European market. The A. Lange & Sohne watches are manufactured only in mechanical variant. These watches movement has some peculiarities forming its standard. The A. Lange & Sohne wrist watches case is crafted exclusively form platinum or 18-carat gold. The back case is connected to the case ring by screws, providing the water resistance. The glasses are made of synthetic sapphire of 9 hardness on the Moh’s scale. The A. Lange & Sohne watch crown as well as its case is crafted from platinum or gold, engraved with Lange. The first wrist watch collection in 1994 includes four models: Lange I, being produced with cases of three different diameters from this year, Arkade, Saxonia and layed off Pour It Merite with tourbillon. Then the watch lines «1815» and Cabaret Langematik (the first Lange watches with automatic winding, marked with originality peculiar to the Lange watches) were released. Presented in 1999 Datograph won the public by perfect harmony of design and technical functions: the movement with column wheel, fly-back, “big” date and precise minutes counter indicator. 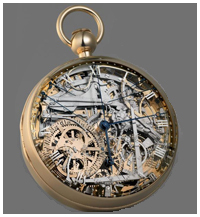 The Lange I Tourbillon model combined the peculiar Lange I appearance and filigree technique of the carousel movement. The Langematik Perpetual model represents the first Saxony wrist watches with perpetual calendar. These watches differ by convenient “main” button, providing to put all hours indicators forward for 24-hours; and today this model is considered to be a trend setter in the world of watches. 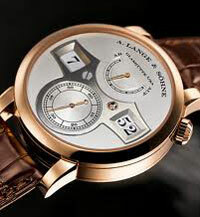 ''World Tour'' of novelties by A. Lange & Söhne! 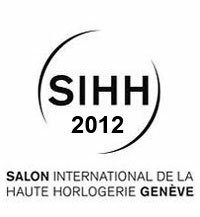 Competition for young watchmakers of A. Lange & Söhne has started!